Blood Wounds by Susan Beth Pfeffer. Review: Try having a killer on the loose that's your father knowing that he might kill you next. 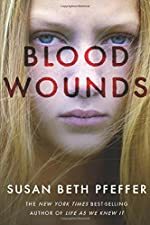 Blood Wounds By: Susan Beth Pfeffer is a story about a girl named Willa Coffey whose birthfather murders his step wife and two of his three daughters and has gone missing with another one of his daughters Krissi. Now Willa and her mother are on the lookout in case Dwayne "Budge" Coffey hoping to make them his next victims. Willa's life is completely turned upside down in "Blood Wounds" as everything she believes true to be different. Willa had no idea her biological father ever remarried' and she certainly had no idea that she had siblings, and now she realizes how little she really knew about her father. Blood Wounds is a book that will keep you on the edge of your seat the entire time you're reading it I know that because it sure kept me at the edge of mine. It was also thrill packed and very interesting to read. You can't tell what is going to happen next, and to me and a lot of other adventure seekers those are the best kinds of books out there. I also enjoyed how even though Willa's father is a murderer she doesn't feel any bit sorry for herself. She only feels sorry for her stepfamily that she never knew existed which makes her seem more real but less human. What I mean by that is of course someone in her pot would feel sorry for themselves which is what makes her human, what makes her seem inhuman is that she doesn't feel sorry for herself what person wouldn't feel sorry for themselves if their father is a killer? I also enjoyed how the book explains the situation really well so you can always understand what is happening I always knew what was going on, and was never once confused. Also I liked how Willa seems like someone who could be your best friend or someone you would meet on the street and would remember for the rest of your life even though there was no point in remembering that person. Also I liked how everyone seems like someone you would either know or would want to know. I rate Blood Wounds ten out of ten because it is perfect for the age group it is listed for. It also truly shows how someone under that pressure and her age would react to the problem. I also enjoyed how real Willa is because her character struggles with her problems and resorts to cutting herself. The courage Willa shows when she asks for help and can be inspirational to someone who also cuts. Also it can help kids who have divorced parents to gain courage to tell their parents how they feel they are being treated, they could also can get the courage to ask them about their other parent like Willa does further in the story. Also I liked how this book makes you feel like you are right alongside Willa and her family. It was an amazing book to read and to write a review about. Blood Wounds is an amazing book to read because it is was jam-packed with action and adventure. That is why I rate this book a ten out of ten. We would like to thank Houghton Mifflin Harcourt for providing a copy of Blood Wounds for this review. Have you read Blood Wounds? How would you rate it?